The mercury rise is peculiar these days and this is the time when you actually wish to suppress your thirst n tiredness .Body loses the maximum amount of water these months and we need to replenish it in the form of juices,salad,ice creams,raitas..n so on .. So friends,The recipe for today is the mix veg salad with Kraft's creamy Italian dressing.The recipe is very simple and a tasty one too.Actually salads are eaten raw,but here I just microwaved some of the veggies for 2 mins and then mixed it up to wave off the raw smell. Wash and cut all the vegetables,keep aside. In a microwave safe bowl,mix all the turnip leaves,cabbage,broccolli n salt. Cook for 2 minutes in microwave. Add all the rest of the veggies and toss well. Add the creamy Italian dressing and toss again. Salad is ready to serve. You can use any vegetables of your choice. You can add plain yogurt instead of Italian dressing. Wow!loved the salad and its dressing.. looks inviting.. Nice presentation.. Salad loks healthy and creamy, love the presentation. 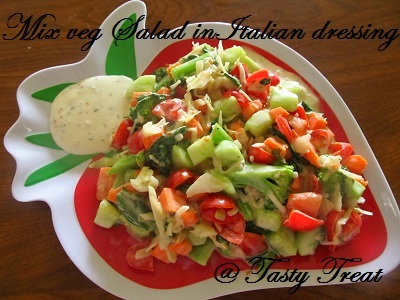 Marvelously colorful salad and it's dressing. Very nice preparation. Love the colors! Great looking salad! very colourful and excellent salad..good presentation..perfect for the summer.. This looks good! I would love to have this cool straight from the fridge! Yummy! salad looks so healthy and colorful !! Lovely salad, healthy & colorful! Simply awesome!